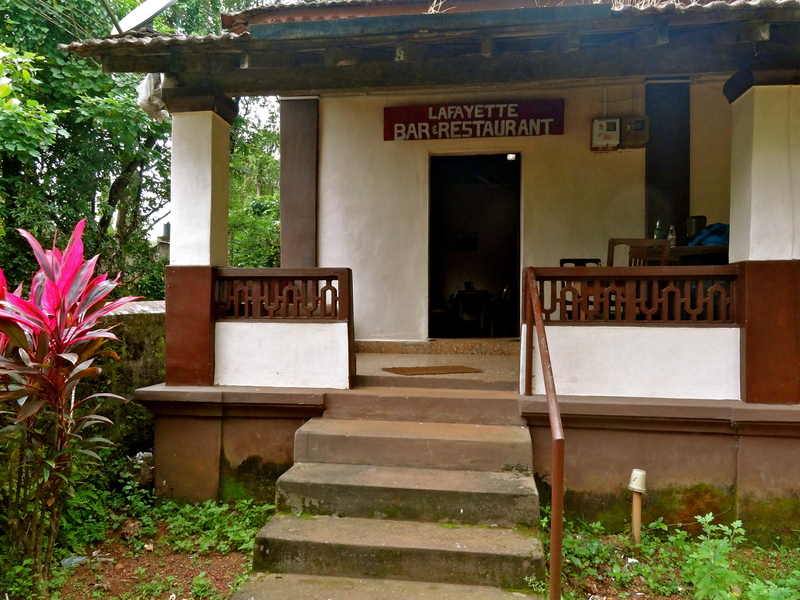 7 Authentic Goan Restaurants in North Goa. My three weeks in Goa (Read: Wake Me Up When September Ends) have busted two myths – that Goa is only about the beaches and crowds, and that Goan food has nothing to delight vegetarians. 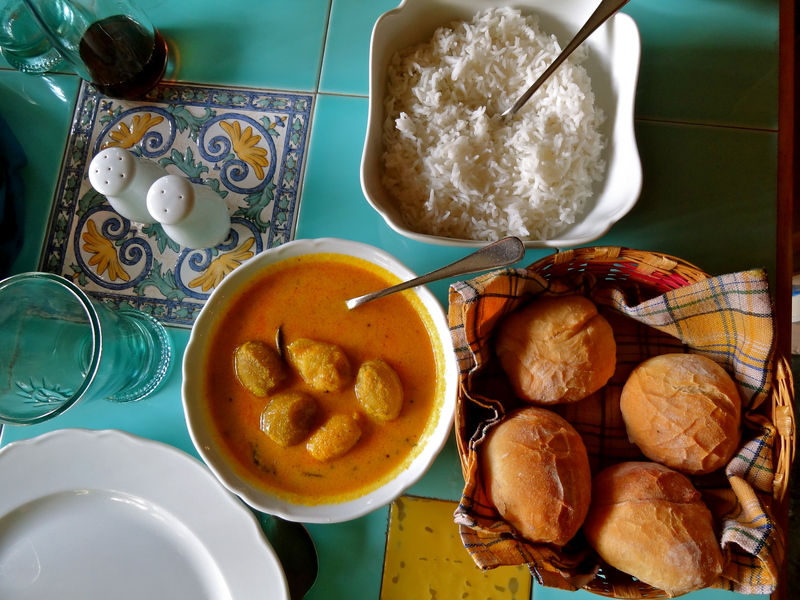 I’ve been indulging my taste buds in local delights, from home-baked Goan breads called Poi and Pao, to seasonal vegetable curries cooked in Goan style, to home-cooked vegetarian appetizers, to Goan sweets and desserts that I had never heard of before. 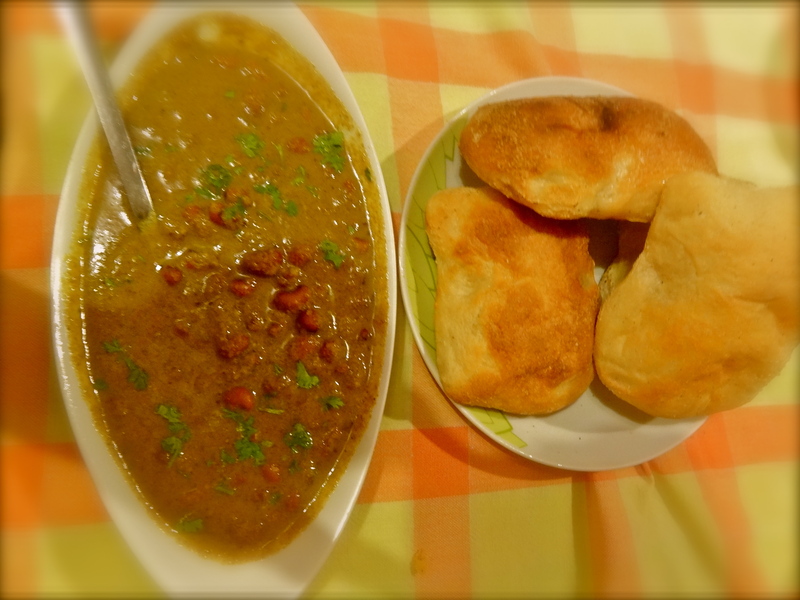 Here are seven Goan restaurants that delighted me, culinarily and otherwise. And for you seafood and meat lovers out there, my friend vouches for these even with carnivorous taste buds! The first thing you notice about Venite is its charming decor. Little balconies lit up with dim lights overlook the street, each with a table for two. Lamps made from coconut skin adorn the rest of the restaurant, while a private group seating area has walls decked with old bottles, and rather creative paint and crayon graffiti. The mushroom pepper fry accompanied by finely cut french fries certainly whet my appetite. For main course, I indulged in a delicately spiced veggie vindaloo curry served with rice, while dessert was a sinful banana-caramel-ice cream combination. The best part? This Goan join has been around since 1955, and many Goans (including my hosts) have been here as kids! 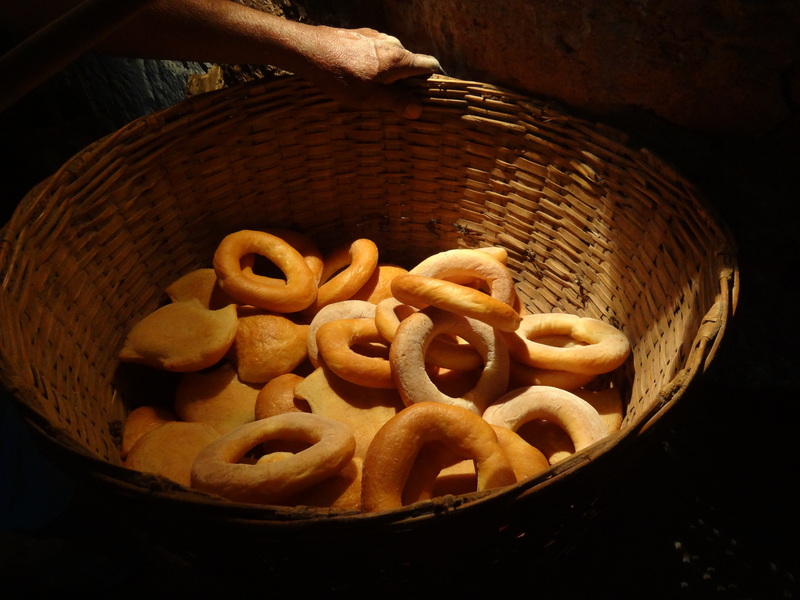 Hidden away in the narrow by-lanes of Nerul village, near Panjim, Bhatti Village is a cosy joint run by a Goan family. Patrick overseas the customers, his wife cooks, and their children (old enough) wait tables. There are no menus; Patrick personally discusses food preferences with you and makes recommendations. We started our meal with a portion of mushroom rawa fry, followed by kidney beans curry and baby corn curry for main course, cooked with Goan spices and a hint of coconut, served with poi; a heavy but satisfying meal! This find was a complete fluke! We landed at Chorao Island late one afternoon, terribly hungry. Most small villages in the hinterlands of Goa shut shop from 1 pm to 4 pm for an afternoon siesta of sorts, and Chorao was sleepier (albeit beautiful) than any village we had seen before. La Fayette seemed to be the only restaurant on the island, and chances of it being open seemed dismal. We walked into a house with a few chairs in the verandah, a big beer barrel, and no one in sight, and hesitantly knocked at the door. A woman, who we clearly woke up, peeped out, opened the door, and invited us in. A sumptuous meal of egg currycooked in Goan style, beer, and conversation followed; she assured us that she never closes her home restaurant, because people feel bad if they come and don’t get food! A typical neighborhood home-joint, La Fayette. 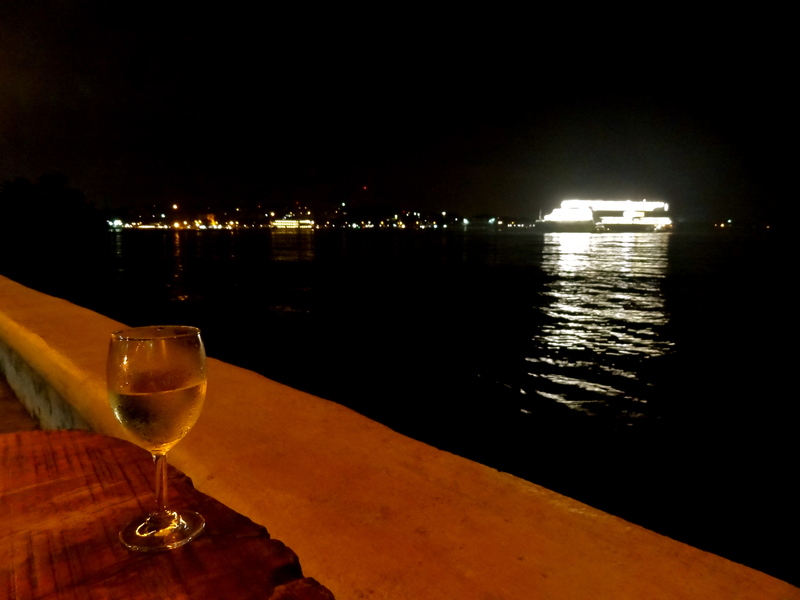 We first saw A’tona from the Deltin Royale Casino ship on the waters of the Mandovi River in Panjim. A signboard and small lights glistened on the shore of the river, and we knew we had to check it out. The owner welcomed us with a warm smile, and though it was closed that night for a private party, let us sit awhile by the shore for a drink. Too bad we didn’t get to try the food, but I can’t recommend it enough for the ambiance alone; think the calm waters of the Mandovi, the stars above your head, and the shimmering lights of Panjim and the casinos in the distance. Wine by the riverside, at A’tona. 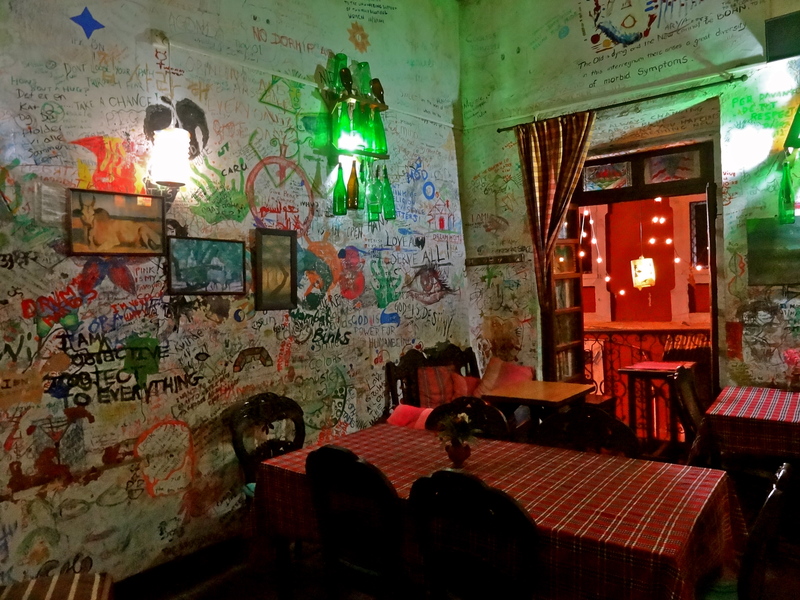 Run by an eccentric ex-navy guy, Andron is the neighborhood Goan eatery you just have to try! The first time we went, Anthony said he couldn’t offer anything vegetarian other than fried rice and french fries, but told me to call ahead the next time. I did, on several occasions in fact, and his chef offered me everything from mushroom xacuti (a thick curry with a coconut base) and vegetable caldeen (a relatively spicy curry with a non-coconut base), both typical Goan dishes, to cauliflower curry and daal curry. The food was delicious each time, but what I liked even more was the ambiance – a few tables huddled together, with dome shaped yellow walls painted with scenes of village life. Mushroom xacuti and a cheerful vibe at Andron. On another late afternoon when most restaurants in Panjim were closed, Mum’s Kitchengave our grumbling tummies some much needed respite. An earthy ambiance, complete with a koi pond and a rustic bar, Mum’s Kitchen is the local haunt for fine dining. Set up by a Goan couple with traditional recipes collected from various Goan households, the vegetarian options on the menu are extensive; I tried the ambotik curry (a sour seasonal vegetable, cooked in a thick sourish curry) and the tamre bhaji (wild red spinach cooked with onions and tomatoes), and loved both! Ambotik curry with rice and pao at Mum’s Kitchen. 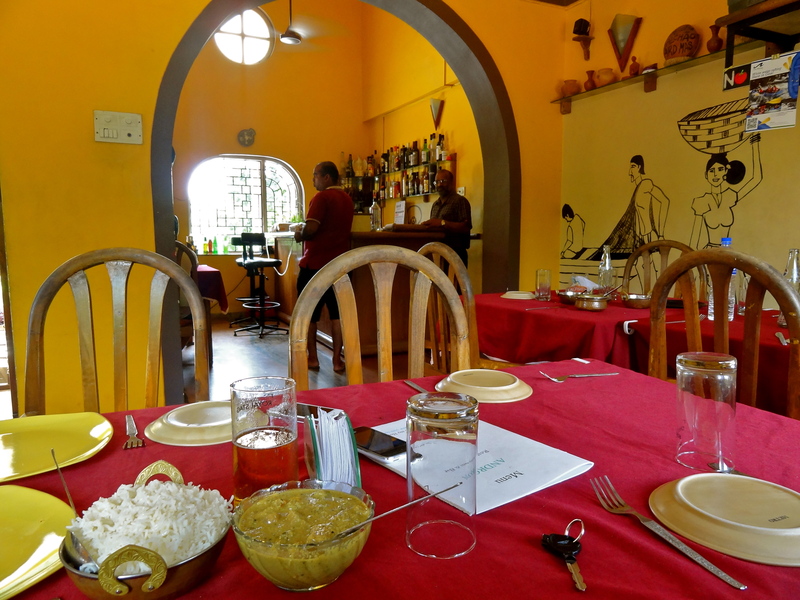 Located in the charming Fontainhas area aka the Latin Quarters of Panjim, The Verandah Restaurant is located at Panjim Inn, a heritage home refurbished into a quaint boutique hotel. The alfresco seating offers a glimpse of old tiled roof houses in the by-lanes below, transporting you into another era. 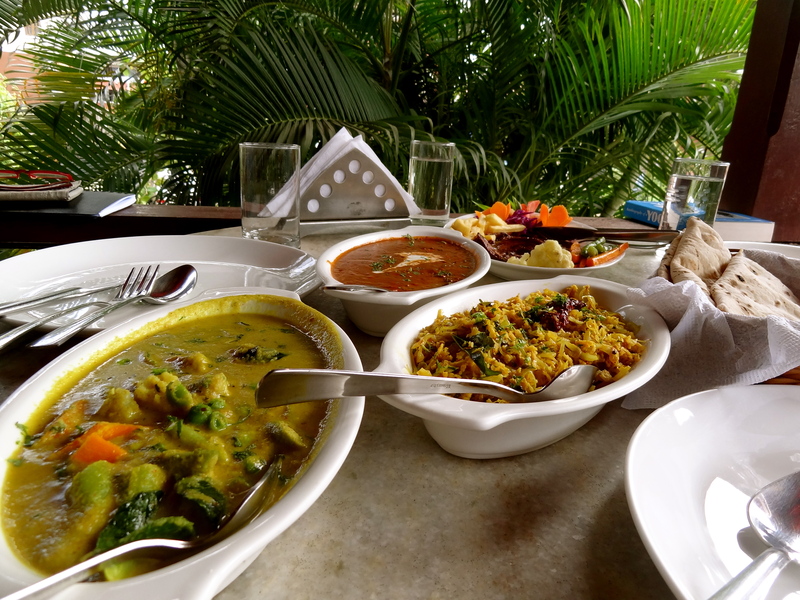 While the menu has a limited vegetarian selection, the chef offered to prepare cabbage fugat (a dry Goan dish cooked with a hint of coconut; beans fugat is its other variant), a Goan mixed vegetable curry and daal, served with hot rotis – all of which were finger-licking good! Cabbage fugat and goan curry at Panjim Inn.